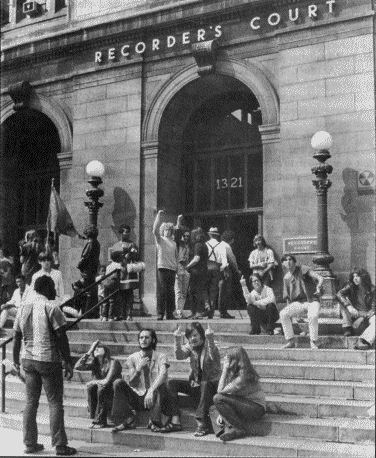 Outside the Detroit Recorder’s Court in July 1969, supporters gather at the trial of White Panther leader and former FE columnist John Sinclair. Comrades, who did not want their photos in any pig paper, flip the bird to Detroit Free Press photographer Tom Venaleck. Sinclair was sentenced to ten years for the possession of two joints of marijuana. Before he was released from prison in late 1971, he garnered international attention and support as a political prisoner. Three days before his release, 15,000 friends gathered for a benefit concert including Abbie Hoffman, Bobbie Seale, Ed Sanders, Allen Ginsberg, John Lennon and Yoko Ono, Phil Ochs, and Stevie Wonder.